Sometimes I wonder about my writing. I keep on and on not because I’m a fantastic writer. No, I know that I’m pretty average, and I’m okay with that. I’ve asked myself why I write and I’ve shared this with you earlier. I’ve spoken about writing as being a therapy for me. But beyond that, writing has become a process of self-discovery. I seem to find myself when I write. I realize what I’m passionate about, what I’m ready to break the rules for, and what I believe deeply about myself, life and the world. I have to keep reminding myself that this is one of the most important reasons for me to keep writing. I tell myself that though my writing might resonante with someone somewhere, it’s not the reason I should keep writing. As selfish as it sounds, I must write for myself. My writing has to be a process of self-discovery and self-revelation. Only when I am myself, can my words mean something to another. It’s easy to get caught up with blogging and forget why we started a blog in the first place. Too busy making sure the images are the right size, the SEO is place, the sharing buttons are configured properly. Too busy catching up with the latest big thing of social media – today it’s Periscope, tomorrow it’s Blab…….Today it’s good to guest post, tomorrow it’s not a great idea…..Blogging is wonderful, but it can keep us from writing! Ironical, but true. It’s important then that we keep asking ourselves why we are in the business of writing. I’m linking to Finish The Sentence Friday hosted by Kristi Campbell of Finding Ninee. This week’s topic is “Sometimes, I wonder about my writing. I keep on and on because…” Feel free to adapt the sentence to “I write because…” or “I wonder why I write… Read the other fabulous posts there. You made some excellent points in your posts. The most important is to remember why we started the blog on the first place. If it’s a part of a business, is it there for informative reasons or just writing our personal thoughts? There are so many questions to be taken into consideration. You are also right, SEO and planning ahead can be distracting many times. The biggest fear is doing something for your blog that you don’t want to but you have to so as to get attention. What I mean by that? So let’s say that someone doesn’t want to make guest posts but they do it anyway so as to bring more traffic. So many things to ponder after reading your post! Please keep inspiring with your writing! I completely understand, Leanne. One of the reasons, I skipped the challenge this year is that it creates too much pressure for me and I don’t enjoy it any more. Writing my blog is my therapy and keeps me grounded. Thanks for sharing, Savvy. Writing is truly therapeutic. Excellent points. I’m sorry to say that I’ve not been visiting lately because of commitment to the A to Z Challenge. Ironic, no? At least I’ve gotten started on a poetic little romance piece. It feels good. And, yes, I’m writing it for myself. So glad I found this. And you! Be well! Darla, I completely understand. The A to Z is hectic as ever. Thanks for stopping by to comment, all the same. Looking forward to reading your poetic piece soon. I love the social part of blogging in terms of making connections, but sometimes keeping up with social media is too much. If I don’t, who will read my writing? But if I spend too much time on the non-writing stuff, I don’t have time or energy to write. I know many bloggers struggle with the same issue! Finding the correct balance between the two is so hard, is it not, Dana? Something I constantly struggle with. So beautiful, Corinne. Why do any of us write? For me, I can’t really tell what I’m thinking unless I take pen to paper. And then it takes time to get it all down. The only thing I take exception to is you saying you’re an average writer. You’re a wonderful author and blogger. So glad I got to know you through your lovely words. Aww you’re too sweet, Laurie. I know my limitations and attempt to work within them. I like what you say, that you don’t know what you’re thinking until you write it down. It’s pretty much the same with me. I agree with you though. I love writing, and it also helps me to organize my thoughts. For years I was so much better at writing than I was at speaking. Writing just gave me the opportunity to organize my thoughts before I put them out there. Lately I’ve gotten better at speaking as well, so gotten more into videos as well, which has been enjoyable. Both media offer something different, and now I enjoy them both. It’s great to know that you are working on a new skill. I’d love to vlog too. Haven’t done public speaking in ages, and wonder how I’d feel speaking only to a camera. Kenya, I would have dropped Facebook too if not for some great blogging groups. I refuse to try out the next best thing! Would love to have you join us every Monday. Sometimes we forget the reason we started writing, Naba and it’s important for us to remember that. Thank you for sharing. Lvely musings for this Monday. Found you through FTSF prompt and glad I read this. Do I write for me or for others and to what degree? It’s a good question, with a different answer or degree of an answer, depending on the day I ask it. Nice to connect with you too, Kerry. I understand how our answers can change depending on how we feel and what motivates us to write on a particular day. I absolutely agree. I have always loved to write, but in the last few years my writing has very much become a vehicle for better understanding and knowing my Self. This is a beautiful reflection – you nailed it! It’s a passion for me. I need to do it. A lovely reason, Liv. Thanks for sharing! I feel like the biggest issue I have with my blogging is time! Also, if you’re like me, you spend a fair amount of time doing web stuff on the back end. Don’t even mention Blab. That’s my next thing. I admire you and appreciate the Monday Musings! It’s helping keep my writing regular. Thanks for your dedication to the blogosphere! Frances, I love doing backend stuff on the web and that can be a big hurdle to actually writing. So glad you’re joining us every Monday! Thanks for sharing, Esha. I’m glad writing just happened to you – you do it so well! This is a great reminder Corinne. I mostly blog to touch base with others. I wonder if others observe what I observe, do they find funny what I find funny. I see myself as the weirdest person on the planet so it’s nice when someone shares my point of view or laughs at what I laugh at. I love your take on things, Karen. So you know at least one person who gets it. I do see that you have quite a following – so there are a lot more people who do! Love this post, Corrine. I think you are right that it can be easy to get distracted from what brought us to the page to begin with particularly given the demands of social media. I find that my attitude toward all of it ebbs and flows, mostly though I do enjoy the connections that I have made through groups on line. As for why I write? It keeps me grounded, if not tethered to my sense of self. Thanks for sharing your musings today. I think most of us have a love hate relationship with social media. We need it, yet we hate that it often takes up too much of our time. I love that you say writing keeps you grounded. It does the same for me. This post really resonated with me. I started writing and blogging 4 years ago, and at first it was because I wanted somewhere to put my writing. Then my blog got popular, and companies started reaching out to me with sponsorships, and I really fell into a black hole of “posting because I was going to get paid.” I completely lost touch with how much I really enjoyed writing for myself. So last year, I deleted my blog, and restarted a new blog that is now solely focused on ME and MY writing that I do for myself. I’m SO much happier now that I’m completely immersed in writing for myself again. Oh I know the feeling too, Jasmine. Now I’m back to writing for myself as well and glad that I’ve made that choice. I have to agree with you. I’ve learned so much about myself through writing and I know I have a long way to go. I’m still trying to work out what I believe in. We all are, Rena. Thank you for sharing. I am glad you write. I love to read other people’s perspective from other cultures in other parts of the world and see the commonality to all of us! Thanks, Haralee. That’s another part of writing that I love – the connections I make, like the one I have with you! I write because I have to, because there are things I want to say and I believe I say them best in writing. 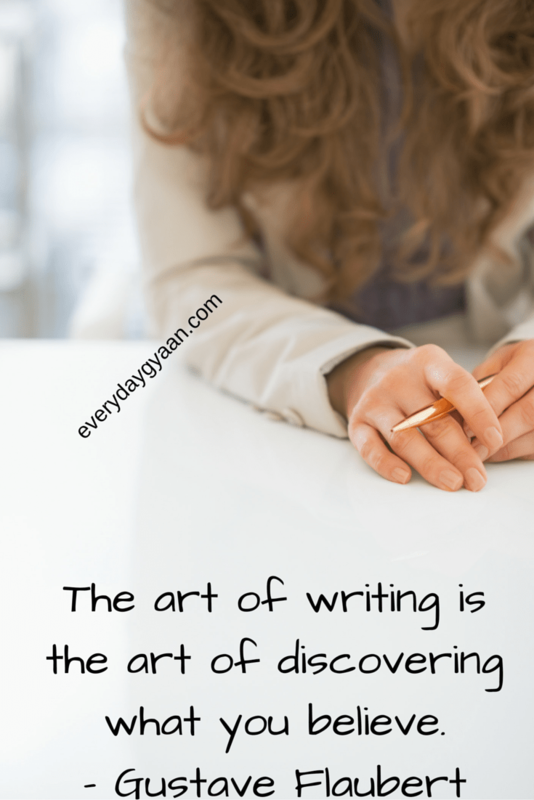 I also agree that writing is a big help in self-discovery. It’s amazing what we can find out about ourselves! I too feel I express myself best in writing and get much more clarity on my own thoughts when I write them down, Carol. Berriste sing lead to decades ago I firmly believe I wrote to teach others about life (cringe). NOW I realize I write about my life so I can understand or make any sense about my own damn existence. Oh yes, I think I too started out that way, thinking I knew it all, Carla. I write for myself, and if others find value, all the better. Writing is cathartic and creative and fun. It’s a great question to ponder. That’s the best reason to write, I discovered. Thanks for sharing, Kelly. I have been writing since 5th grade and I am in my 60s! It is who I am. Wow! That’s a lot of writing. Thanks for sharing, Pam. I write because I must or I will explode. The thoughts that race through my head must have an outlet and writing is the best one that I’ve found! I know that feeling, Jennifer. That is why writing is so cathartic. Mind provoking post, Corinne. I was always wondering why I write. But not penned down earlier. Today I did it. 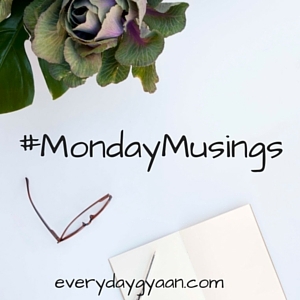 Actually I was about to write another piece of words for today’s Monday Musings but your post made me to write this and reserve that for next week. But I am glad about that. I enjoyed reading your post, Viveka. Thanks for sharing. What a great idea a self-retreat is, Mary. I’m going to try that out soon. Thank you so much for sharing. You are SO right about this Corrine. Blogging and drowning in all the details and work of it all- ironically keeps me from writing! I totally get that. I love that you are writing to discover more about yourself. That point really hit home for me, as I too realize how much I have learned about myself through writing. Such great insight! Thanks, Christine. Sometimes I feel we put too much pressure on ourselves as far as the ‘non-blogging’ part of blogging goes! I’m so glad you added this to this week’s Finish the Sentence. It’s a topic I think that we could write about over and over and over again because it’s complex. We look at the origins of why we write, we look at the pain of when we do, and we look at the rewards too. It’s a huge thing, this writing publicly and one that I think we should explore more. I especially felt your words about blogging and how easy it would be to write for others – I’ve had challenges with that for sure. Thanks for the great prompt, Kristi. I know I can write about this next year and probably have another reason to write! Such a good question – why do we write? It’s good to have this in your head all the times to ensure you stay authentic and not get bogged down in the latest blogging fads. I agree with you, it’s a journey of self-discovery and I love what you said; “only when I am myself can my words mean something to another”. Thank you, Tamuria. Staying authentic is key. Thank you! This is such a wonderful question for a blogger like myself. I love your point about obsessing on seo and keyword. For me, the obsession lately has been photos. I put so many huge featured photos in my movie reviews it slowed down my site big time. Luckily the hosting company coached me through some optimization tips so hopefully that won’t happen again. I’ll write an answer to your question on my blog because I think the topic has great value. Have a great Monday 🙂 It’s still Sunday over here in the US. Thank you so much for sharing, Damien. I’m image obssessed at the moment and it takes me ages to create, what I think are the right images for my posts! Crazy, but it’s a phase I hope will pass!